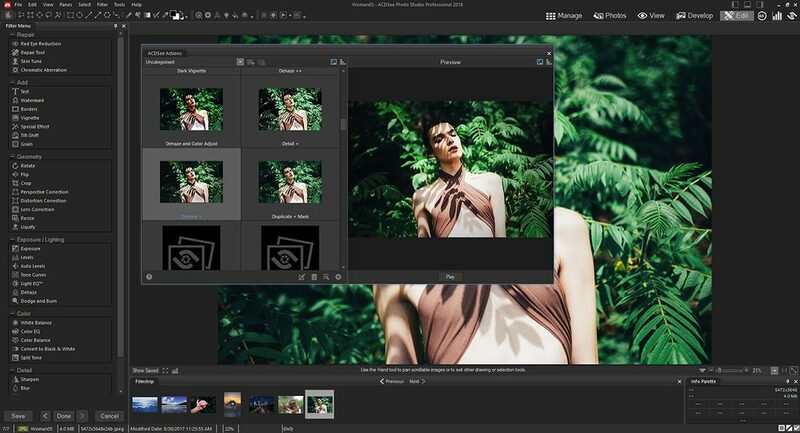 ACDSee Photo Studio Professional is everything you need to hold complete mastery over your photography workflow. Take what you want from your photos, and integrate the rest. Select unwanted objects for removal and use the Smart Erase function to fill in the area with a matching background. This content-aware tool will produce a natural result even while extracting elements like telephone poles, crowds of strangers, imperfections, ominous clouds—whatever you want. Creative image manipulation has never been so fluid. The Liquify tool allows you to distort objects in images without compromising quality. Shift, pinch, bulge, or restore. Develop free-flowing designs, or retouch portraits by moving pixels without altering them.